September has always been a time of travel for Noriko and I. 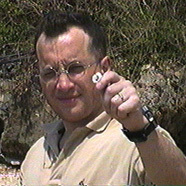 This year we visited Okinawa, Japan's southernmost prefecture--and the site of the largest ever air, sea and land battle. For most Japanese, Okinawa is a place of fun and sun. A scuba-diving paradise. We went there to visit two of our best friends, Steve and Ikuko Trussell. We did not swim, however, as Steve is "afraid of sharks." But we toured the entire island and had a great time, nonetheless. Here is a photo of a "scared" Steve. But it is not sharks he is worried about this time. The best part for me was visiting various World War II battle sites. And drinking Orion beer, the local brew. Here are a few photos from our trip. As Noriko and I were exploring the wilds of Okinawa, Mom and Dad Diederich were conquering Europe. They both retired earlier this year, and decided to treat themselves to a cruise aboard the Queen Elizabeth 2. Five days of luxury from New York to London. The actor Gene Hackman was also on board. Mom said he "looked taller and younger in person." Gene Hackman is cool. He can play the heavy or the hero with equal perfection. Apparently he can also paint. Mom and Dad were having tea one afternoon, and were chatting with one of their new friends, "a nice European woman," according to Mom. Anyway, the woman said that this "nice, middle-aged man" sat across from her during a painting class. "He was a fast painter; he finished so much faster than the rest of us," the woman told my parents. "I told him so, and he said that he had painted me. He showed me the painting, and it was so good that I offered to pay him for it. But he would have none of that. 'You can have it,' he told me. Well, I asked him to sign his name, and he did. It wasn't until later, back in my cabin, that my husband told me that 'Gene Hackman' was a famous Hollywood actor." After three days in London, my folks went on a whirlwind tour of France, Italy, Austria, Switzerland, Germany and the Netherlands. Read more about their trip from Dad. 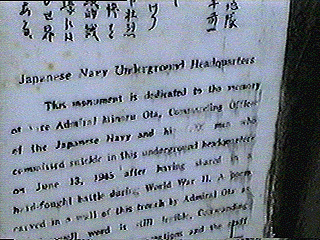 And now a little history: On June 13, 1945, a unit of U.S. Marines found the "Japanese Navy Underground Headquarters" on Okinawa, an extensive network of tunnels carved deep into a hill below Naha Airfield under the command of Admiral Minoru Ota. The HQ had electricity, hot-and-cold running water, medical facilities, lavishly-furnished officers' quarters, an operations room and much more. 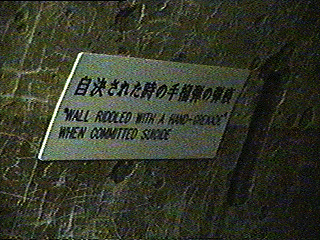 Nowadays, as a tourist attraction, it is merely a dank, concrete maze. But fascinating, nonetheless.